Sonali is currently a master’s student and is studying Human Computer Interaction at the University of Michigan. By marrying her design and development skills, she is able to create fresh, interactive experiences for the Web, augmented reality (AR), social computing, and voice-based applications. 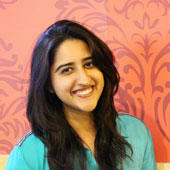 She has worked as a UX Design Intern at MediaMath, doing UX research and design for their next-gen marketing platform. Before moving to the US, she worked as a Senior Software Developer at Akamai Technologies in India, where she developed Web applications for Akamai’s Partner Portal. Connect with Sonali on LinkedIn.